DEVILSKIN’s new song "ENDO", is a powerfully crafted and visceral masterpiece. Not only does it showcase vocalist Jennie Skulander’s incredible power, range and emotional depth but the lyrics are an honest and brutal narrative of her personal struggle with stage 4 endometriosis. The band explore dynamic new territory with this moody, rollercoaster of a song. Recorded at Roundhead Studios with producer Greg Haver (BULLET FOR MY VALENTINE, MANIC STREET PREACHERS), engineered by Simon Gooding (ALIEN WEAPONRY, Neil Finn) and mixed in Los Angeles by Ben Grosse (MARILYN MANSON, DISTURBED, STONE TEMPLE PILOTS), the song was mastered in New York by Ryan Smith. Watch the video on KNAC.COM HERE. 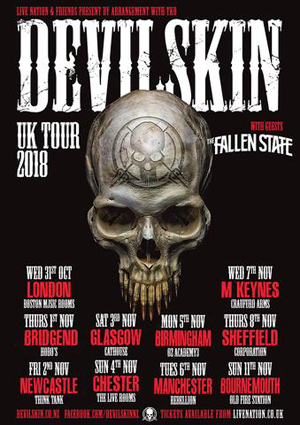 DEVILSKIN display confidence and a mastery of their art with a delivery that’s both beautiful and bombastic. The gorgeous close vocal intro gives way to a crushing, all-powerful riff and the song twists, turns and totally engulfs the listener, just like the condition itself. “We've been writing a lot and really digging deep into the songs and the emotions involved. We have definitely evolved again as songwriters. We love to write our own rules, push boundaries and kick down barriers. You need to in order to grow” says band spokesman Paul Martin. Deborah Bush CEO of ENZ, said that more than 120,000 girls and women have endometriosis in NZ and it can take 8+ years to get a diagnosis. The most important thing is to recognise the symptoms early and follow a recommended treatment plan to avoid symptoms interfering with schooling, career, relationships, quality of life or fertility downstream. "ENDO" will be available on all digital platform services Worldwide including Spotify, Apple music, iTunes, Google Play and will stream on the DEVILSKIN YouTube page.